Meet Samuel and Duncan ~ the boys arrived at the sanctuary on World Vegan Day, November 1, 2016. Their lives were destined to be short lived with Thanksgiving just around the corner. 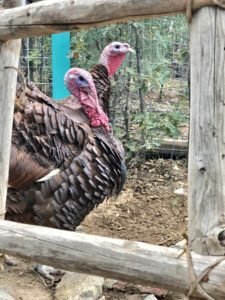 They have found sanctuary here and will serve as a reminder to visitors that their lives are for living not for eating. They are gentle, trusting and inquisitive and love to say good morning in their own little way.